The Seventh Million is the first book to show the decisive impact of the Holocaust on the identity, ideology, and politics of Israel. Drawing on diaries, interviews, and thousands of declassified documents, Segev reconsiders the major struggles and personalities of Israel's past, including Ben-Gurion, Begin, and Nahum Goldmann, and argues that the nation's legacy has, at critical moments--the Exodus affair, the Eichmann trial, the case of John Demjanjuk--have been molded and manipulated in accordance with the ideological requirements of the state. 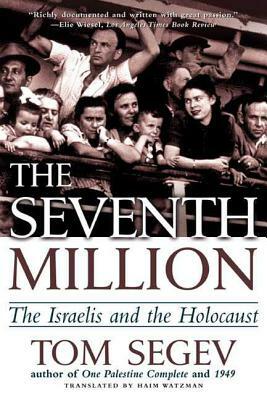 The Seventh Million uncovers a vast and complex story and reveals how the bitter events of decades past continue to shape the experiences not just of individuals but of a nation. Translated by Haim Watzman. Tom Segev is a columnist for Ha'aretz, Israel's leading newspaper, and author of three works on the history of Israel, 1949: The First Israelis, The Seventh Million: The Israelis and the Holocaust, and One Palestine, Complete: Jews and Arabs under the British Mandate. He lives in Jerusalem.